Olympic gold medalist Nastia Liukin is tearing up the dance floor with partner Derek Hough on Dancing with the Stars. She's flying back and forth between her home town of New York City to Los Angeles for the show while also maintaining a full class load of 16 credits at New York University (NYU). That schedule alone is exhausting, but it hasn't stopped Nastia from pursuing her passion for talking with tween and teen girls and inspiring them to be the best they can be. She shares her messages about the importance of goal setting, motivation, a good support system/strong friendships and self-confidence through talks and special events, including "A Night to Shine with Nastia Liukin." Tween Us: Your message is for all girls but you are focused on tweens and young teens specifically. What about that age do you think is so interesting and/or important? 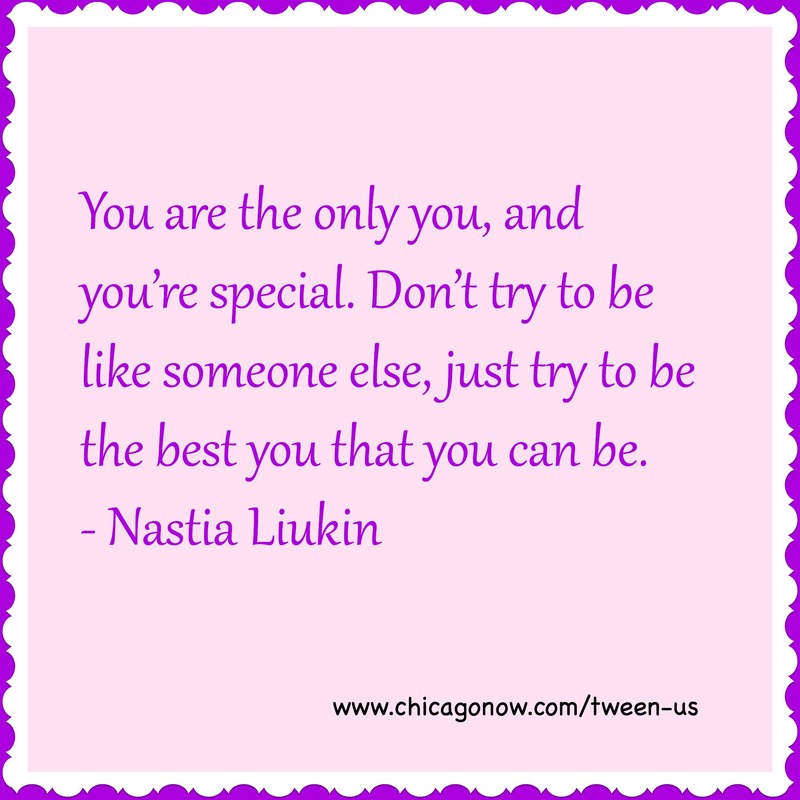 Nastia Liukin: That's the age where you’re really struggling to figure out who you are and what you love and what are your passions and goals. For me, that was such an instrumental age for my life and career. The choices I made then led to me to where I am today. It’s important to teach them the importance of setting a goal and achieving it. I always had daily, weekly, monthly, yearly goals and the big goal was the Olympics. My next goal was college and I’m on that path now. The importance of hanging around with the right crowd is a hugely important at that age. I want girls to know that you should surround yourself with people who love you and will support you. Confidence can be elusive for tween and teen girls. What advice do you give them about feeling confident? Don’t compare yourself to anyone else. With social media, it can be hard, but don't do it. Every single person is different. Stand up and be proud of who you are. You are the only you, and you’re special. Don’t try to be like someone else, just try to be the best you that you can be. You talk about the importance of finding your passion in order to really shine. What advice do you have for girls doing that and for their parents? Find a bunch of different things that interest you and try them. It is so important for girls to to make sure it is their passion, not their parents' passion. My parents encouraged me to try other things and didn’t want to push me into gymnastics. They wanted me to find my passion and goals. If the parents and/or coaches want it more than the child, then it's just a set up for failure. What about girls who aren't sure what their passion is? Finding passion may take some time and that’s okay. Don’t have to know what you're doing at 5 or 10. It’s okay to not know. Also, it’s okay to not be successful. I have had huge ups and downs in my career, from making the Olympics in 2008 to literally falling on my face in front of 20,000 people at the 2012 Olympic trials. You don’t learn too much from moments of success. Of course, hard work pays off and you have to battle, but it’s the moments of disappointment and sadness that you learn a lot about yourself and life in general. What's important is that you pick yourself up and finish it. What was something your mom did when you were a tween that you may not have understood at the time but are grateful for now? She said that she wasn't going to going to push me into a sport but she also said she wasn't going to let me quit because of one bad day. She waited until I had a good day and after that good day, she asked if I felt the same way about my decision. That's true not just gymnastics, but in all things in life like a job or marriage. There are going to be bad days where you are not always smiling, but you have to make it through the hard times. Those are the days that you’re getting stronger. What’s the most surprising thing that you’ve learned in your first two weeks on Dancing with the Stars? Between Derek appearing in the Rockette's "New York Spring Spectacular" and me taking 16 credits, and then flying coast to coast, the schedule is a bit daunting but it’s going well. It’s really fun but also really tiring. How is Derek as a partner, and in what areas is he pushing you? Derek has really brought me out of my shell and I’m grateful for that. He’s an amazing partner and I'm so lucky to be partnered with him. It wouldn’t have worked if it wasn’t him. I’m not one to let go and just start dancing, so it’s been interesting. I was very stoic and serious when I competed. Derek is telling me to relax and have fun and I’m all, “Oh yeah, right." It's a chance to show different side of me, one that I haven’t really seen much of myself. Do you think college is important? I do. My dad told me that you never know how far you’ll get in your gymnastics career, but an education will stick with you the rest of your life. Looking back, I’m thankful that I remember that because it is important to explore and expand your mind and meet new people and get outside your comfort zone. College is a time to explore and figure out who you are. How did you pick NYU? I always wanted to live in New York and this is the perfect time to do so. Texas will always be home, but I wanted to start fresh and open a new chapter without gymnastics and figure out who I was. It was the perfect opportunity. 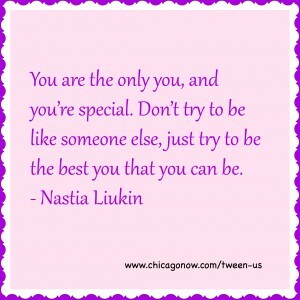 Nastia shares more advice and stories with girls at her events. She's appearing at more than 10 locations through the spring and summer, including a Chicago event in suburban Westmont on April 10. Find more information here. Although the venue is at IGI Gymnastics, Nastia stressed that this event is meant for girls of all ages, athletes and non-athletes, because everyone can shine.